Insurance executive Peter Huber learnt from an early age that a strong work ethic - and a good bicycle - can bring rewards. 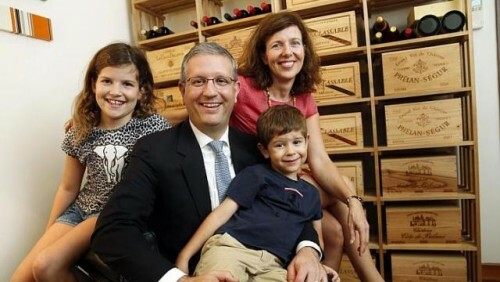 Mr Huber, now the chief executive of Zurich Life Singapore, had various part-time jobs during his school holidays, including one that required him to pedal all over town on his bike, distributing flowers. "When you bring in the flowers, people are usually quite happy about getting them and they always gave you some tips, especially around holidays, like Valentine's Day, when you got the most tips," he says. Mr Huber, 43, also had the chance to experience the famed Swiss precision up close when he worked in factories making small technical products. "Despite the dull work, it was for high-precision instruments, so you had to really stay focused on getting the quality right," says the Swiss and Spanish citizen. "The quality measurement was really tight, so if you got it wrong you had to throw it away and, if you had to do that, it would cost a lot of money. I admire people who do this their whole lives." Mr Huber wants to pass on the same strong work and money ethic he developed to his children - Alina, nine, and Alejandro, five. "I remind my children that not everything is free. They are still young, but my daughter has realised it and asks, 'If I wash your bike, will I get $2?' I have not seen her do it yet though," he adds with a laugh. "I think there is that understanding there and they are prepared to work." Mr Huber, who studied law in Switzerland and finance in London, has been in Singapore since 2013, and has developed a soft spot for laksa. He began his career in business consulting with Arthur Andersen, now known as Accenture. This is his second stint in Singapore. The first was in 2011 when he stayed for 19 months working for Allianz before returning to Switzerland for a year. The executive has had some crazy luck with stocks over the years, including "a great story" about cashing out at the right time. The dot.com bubble had burst just after he cashed out on his technology stocks, which helped to pay for the down payment on his first property. As part of his master's in science in finance at the London Business School, he took a financial centre study trip to New York in March 2000 and was on hand to witness the Nasdaq's biggest upswing in its history up to that point. He flew home soon after and saw an opportunity to buy his first property. "I was flying back that evening to Zurich. I was sitting in the plane, reading the newspaper and I saw an advertisement about properties in Kusnacht, which is next to Zurich," he recalls. "I landed at 11am and I called them up and went to see them. I called my wife in the afternoon and told her I had just put our names down to buy it. She said, 'What?'" He and his wife went down to take a look at the property on a Saturday and he sold all his stocks the following Monday "because I needed to use the money to make a down payment and, coincidentally, I was lucky to exit before the market really started to burst". The crash erased US$5 trillion in market value of the technology companies then. Mr Huber says: "I was lucky. I cashed in because I needed to use the money. I'll never forget it. Biggest swing, sit in the plane, buy the property and the market tanks." I believe in saving; I think it is very important to save. The earlier you start, the better, because the power of compounding is not as well known as it should be. I say the same thing to our customers - you should buy protection when you are young. It is the cheapest then and will give you peace of mind in the long run. It is the same thing when it comes to saving. I don't mind spending, don't get me wrong. I am fortunate to have a good lifestyle, but nevertheless, it is important to put your money aside. It depends on business trips, holidays and so on. On average, it is roughly between $3,000 and $4,000 a month. Q:What financial planning have you done for yourself? In 2011, I did a thorough long-term financial planning review, a really holistic plan going through what my expenditure and earnings were going to look like, when I wanted to retire, what lifestyle I wanted after retirement and all that. From there, you can estimate what savings or wealth you have, and your outstanding mortgages. That was useful to do and it was done in two days with no break. You enter all the data into the IT system. If you are not honest with yourself, that is the biggest risk because you get either a too-good or too-bad picture. But if you have that done once, it is really good as it gives you some guidance. I have properties overseas, a regular savings plan - basically unit trusts - and a hedge fund investment. Unit trusts are a cost-effective way to invest, as I can balance my risk and it lets me sleep well. I don't have time to follow the stock market every hour. It just works for me. Obviously I have life insurance and an annuity protection plan, in case of disability. I use professional advice. I also keep a certain amount of cash as it is good to have some liquidity. It has probably been on the higher side in the last few years, given the uncertainty in the markets. Q: Money-wise, what were your growing-up years like? In Switzerland, I think we have strong and good work ethics. From a very young age, I was told that you need to earn your money. It is good if you know what it means to earn money and look after it. In those days, it was quite common that you had part-time jobs during the holiday season; that is really the first exposure to earning your own money. After high school, I had about five months off before university, and I worked for the post office for three months. That was a full-time job... and, at the same, I beefed up my English skills. I usually worked from 5 o'clock in the morning to 12pm, which was very good. I got more pay and, in the afternoon, I could play football. With that, I financed a trip to the United States for three months. I went to Hawaii first for three weeks and went to a language school in San Francisco for two months, which was a really good experience. That was how I grew up, with a good attitude and work ethic - that if you wanted to do something, you have to work for it and then you can achieve things. Also, I have been fortunate to always find jobs, especially in Europe, which is not a given as there is quite a bit of unemployment. During the dot.com boom, a lot of my colleagues were buying tech stocks around 1998, so I started as well. I bought tech unit trusts and some stocks. The dot.com companies had no revenue or earnings, but had huge multiples in the stock market and everything was going up and up. I also remember that the Swiss Market Index - Switzerland's blue-chip stock market index - was doing well. A lot of Swiss companies were doing well. There was generally a lot of hype at the time. At a certain point in time, I trusted discretionary managed portfolios but I realised during the next financial crisis that I did not understand some of the fundamentals. I had some investment in a US commercial real estate fund, which I still hold today, but it is now closed so you cannot sell it. You really need to be comfortable with what you have and understand it in detail. My awareness around investing has changed and I spend a little bit more time looking at it. Last year, I bought two structured notes and they got recalled 10 days after I bought them. It was fine because I got the money and coupon back, but when you have spent the time studying and analysing a certain product, and then it is recalled, it can be quite irritating. It is their right and you know that, but it is frustrating and you have to start all over again. If I don't understand an instrument, I will not even look at it. I always tell the bankers to explain things to me, and if they cannot, there is no point. Some structured products are so complex, honestly, and I have a financial degree. One in Kusnacht, Switzerland, and one in Spain. My apartment in Switzerland is about 230 sq m. It is rented out and I do not intend to sell it. The semi-detached house in Spain is a holiday home. It is not rented; it is really for us, as a family, to enjoy during the holidays. My mother lives in Spain too, 10 minutes away from the house. I like watches so I have six or eight. I have not bought any recently because I have lost a bit of inspiration maybe. Over the past few years, I have bought one every year but they don't cost hundreds of thousands. The most expensive one is maybe $15,000. I like to wear them so they must be functional. A few years ago, I decided that I am not going to retire. If you want to stay fit physically and mentally, I think it is good to continue to do something. I don't know exactly what that something could look like at this stage. I don't plan to go somewhere at the age of 65 and do nothing, that is a scary thought for me. A townhouse in Bukit Timah. The first time we lived in Singapore, we were on one side of the pool, now we are on the other side (laughs). It gives you a different perspective. A Mini Countryman, but most of the time, I ride a BMW motorbike. I like techy stuff and BMW is a great engineering company. I am a very defensive rider. I wear a proper bike jacket with armour in it. I know what I can do on the bike, I trust myself, but you are also very vulnerable on the bike.